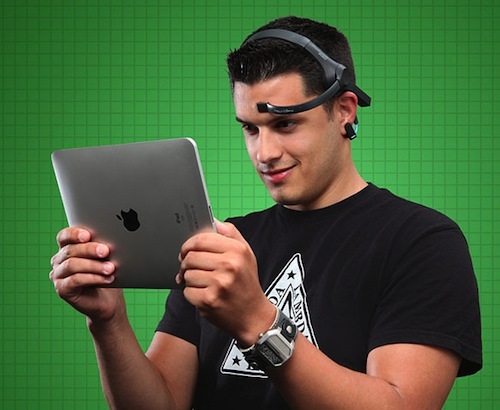 NeuroSky has been working on consumer electromyography (EMG) and electroencephalography (EEG) technology since 1999, creating products that can be used in areas ranging from games to health and education. However, the company is perhaps best known in tech circles for its mind-controlled headset, which charts brain waves and wirelessly transmits that information to a computer, assessing the wearer’s states of attention and relaxation. Unlike more antiquated systems – which necessitate spreading a gel between the user’s head and sensors – these handy headsets employ “dry” sensors. They were used in the game Star Wars Force Trainer, a collaboration between NeuroSky and toy manufacturers Mattel and Uncle Milton that enables the user to lift a ball and move it with brain signals, by way of intense focus. Meanwhile, the NeuroSky MindWave, an educational use of the headset, was first introduced to Chinese consumers in 2010 and monitors brain waves to help improve alertness in students. 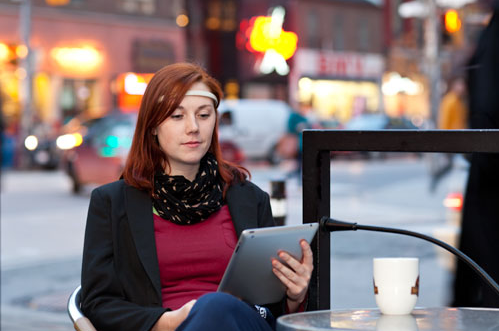 Muse is a lightweight headset launched to consumers in 2012 by Canadian company InteraXon. 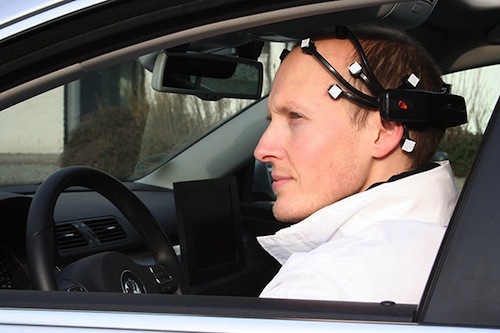 The device has four sensors that measure EEG activity via the forehead and behind the ears and then convey it through Bluetooth to apps on tablets or smartphones. Muse primarily helps train the brain, and InteraXon co-founder Trevor Coleman explained that the tech identifies when the mind is extremely focused as well as when it’s slacking off. “What we’ll do is give you a feedback that will help you notice that your mind is wandering, so you can develop the skill to bring it back,” Coleman says. The company imagines a future in which devices in our homes such as lights and entertainment systems will primarily be controlled by the brain. It has even used Muse to harness brain power to pour beer – though we imagine that power might diminish with each downed brew. 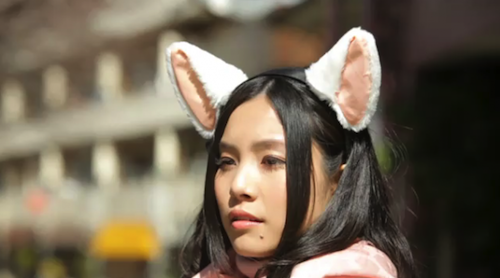 Japan is famously the birthplace of kawaii cuteness, so it’s perhaps no surprise that Japanese company Neurowear has used NeuroSky MindWave technology to fashion these brain-controlled cat-like ears. The adorable appendages, called Necomimi, perk up or turn down in accordance with the brain patterns – concentrated or relaxed – of the person wearing them. Necomimi (a variation on nekomimi, Japanese for cat’s ears) launched in 2012 and currently retail from $69.99 on the Necomimi website. Neurowear also developed a tail version of the device in conjunction with Japanese company Kiluck, but the product is currently shelved after it failed to attract sufficient crowd-sourced funding. Imagine looking at a computer screen and being able to type words just by thinking them. Well, in 2009 Guger Technologies introduced the intendiX to make this geek fantasy a reality. The amazing tech is structured around an odd-looking cap hooked up to eight contacts that concentrate on the occipital lobe – the area of the brain that processes visual stimuli. 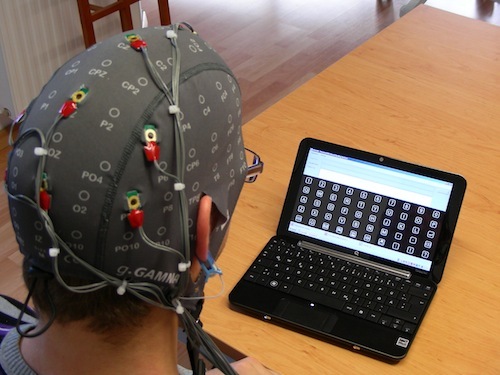 Special software produces a QWERTY keyboard layout on the screen of a computer, and when the user focuses on an individual letter or symbol, a spike of brain activity is generated that tells the system to select that particular character. intendiX can also be used for on-screen painting, something Guger Technologies say will help disabled people to express themselves artistically. 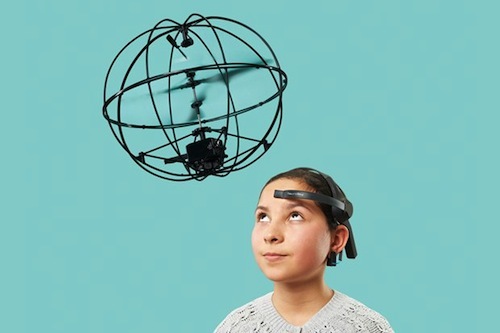 Puzzlebox’s Orbit Helicopter is controlled by brain signals transmitted via Bluetooth to apps on a smartphone or tablet that translate the mind messages into flight commands. It utilizes the NeuroSky MindWave Mobile EEG headset, and concentration and focus are the key elements of a successful take-off and flight. As with flying a real helicopter, skill and training make for a great pilot – and in this case that means learning how to discipline the brain to tap into and maintain the specific mental states that navigate the vehicle. Puzzlebox founder Steve Castellotti has been passionate about how the brain can directly control gadgets since 2004. Speaking about the device – which looks like it’s straight out of a sci-fi movie – he said, “The goal is to provide a fun toy as well as an educational introduction to BCI and neuroscience.” The project was funded through a 2012 Kickstarter campaign, garnering $74,799 in support. Most DJs probably have music on their minds, but the Neuro Turntable makes the connection more literal. With this device, when the DJ is concentrating on the music, it keeps playing; however, a loss of focus causes the vinyl to come to a stop. The Neuro Turntable and corresponding app were developed by Neurowear, which also brought us the Necomimi cat ears. This record-playing device seems designed to encourage a less superficial interaction between the user and the music, because as soon as the DJ’s mind starts to wander, they’re likely to be met with a chorus of boos from the dance floor. 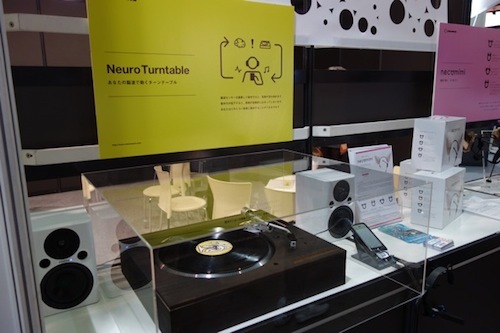 For now, though, DJs will have to stick to the old-fashioned method of switching records manually, as the Neuro Turntable is not yet available to buy. For anyone who claims that skateboarding is a way of life for them, this thought-powered deck from Chaotic Moon Labs could be just the thing. Called the Board of Imagination, the deck (an upgraded version of the 2012 Kinect-powered Board of Awesomeness) harnesses the power of the Emotiv EPOC headset to move itself by brain waves alone. 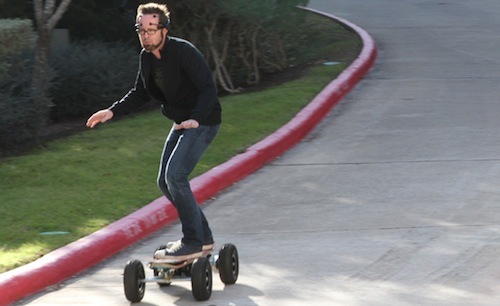 The headset is linked to the 800-watt motor that powers the board, and operation is surprisingly simple. 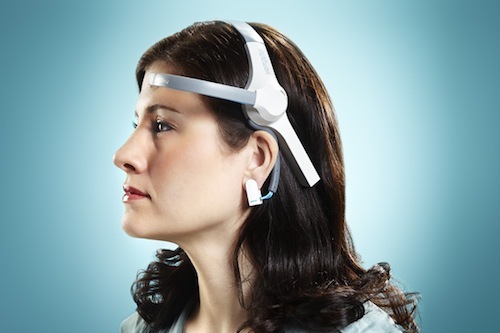 “It detects your brainwaves. It actually figures out where you want to go,” says Phil Wheat, manager of Chaotic Moon Labs. “You imagine yourself being there and it actually takes you forward.” Thankfully, the board doesn’t interpret the user’s thoughts totally literally, so they’ll remain safe even when their brain is fully focused on shredding. The recently showcased Neurocam from Neurowear aims to give photographers’ fingers everywhere a rest, allowing wearers to capture short video clips via their thoughts instead. 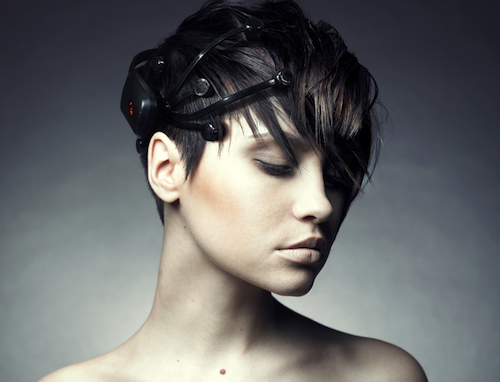 Using the NeuroSky MindWave Mobile as an interface between brain and smartphone, the new device records five-second GIFs of certain sights based on heightened interest detected in the user. 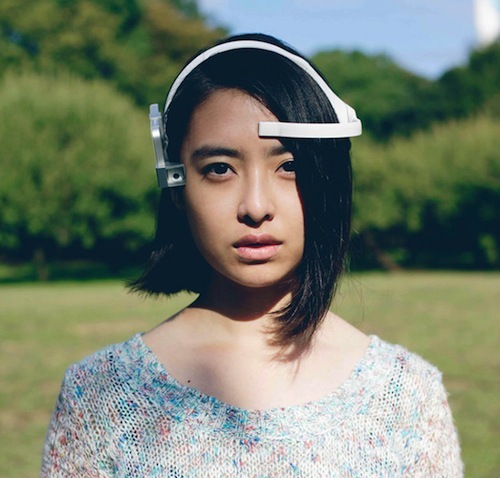 Associate professor Yasue Mitsukura of Keio University, who helped develop the idea, envisions many applications for the device – such as ascertaining which products people gravitate towards in retail environments, or assisting in urban planning by collecting location data from people. Plus, the device could also be put to a much more personal use. “We think it could capture a life log, which would be different from deliberately pressing a shutter to capture things you like,” Mitsukura says.